Karen has raised over $2,500,000 for various organizations. Over the years, Karen Turner has produced fully integrated, award winning events for Saskatchewan organizations and companies. In her capacity as a volunteer and consultant, Karen has raised over two and a half million dollars for various organizations. She holds the National Program in Fundraising Education certificate, and graduated with a 3.946 GPA from Fundraising Major, at Grant MacEwan University in Edmonton Alberta. Karen has extensive experience working and volunteering in the nonprofit sector, which includes the first Jail-N-Bail in Saskatoon. She developed the business plan for Tamara‘s House and coordinated the capital campaign. 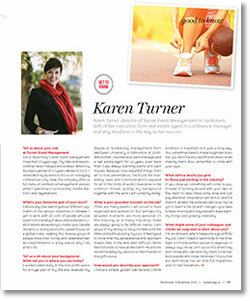 Karen‘s knowledge and experience with the Canadian health care system is detailed in the client list. The 2020 Health Vision Conference was one of three nominated for the CEIA National Awards in Toronto, March 2001. Karen has spoken at National Conferences including the “Special Events Logistics” at the Saskatchewan Society of Fundraising Executives Conference along with the big “three” International Fundraising Consultants in November 2001. In February 2003, Karen was nominated for the prestigious CEIA National awards in Toronto for best fundraising event.